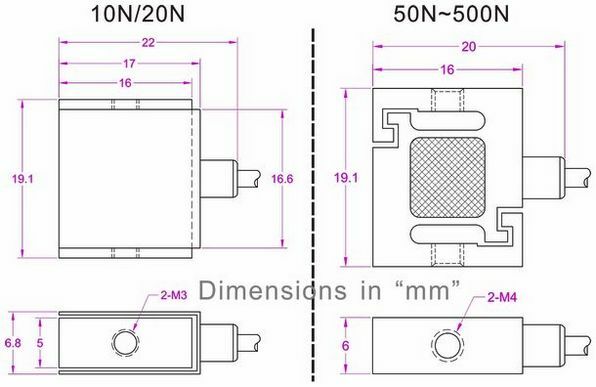 Jr s beam load cell FSSM offers a perfect mixture of size and accuracy,19.1*16*6mm compact size makes it suitable for applications with limited space,maximum 0.1% F.S. non-linearity can meet most measurement requirements in force detecting and auto processing applications.Improved 0.05% non-linearity is available for 50N/100N/200N/300N/500N/1kN capacities. Full-bridge strain gauge technology provides mV/V output proportional to the applied force.0-5V/0-10V/4-20mA output is available by connecting Forsentek signal amplifier FSC,force value can be displayed through load cell indicator FPT which supports RS485/RS232 communication interface and analog output. 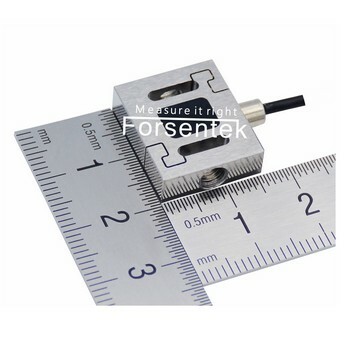 Miniature force sensor FSSM is configured for tension and compression force measurement, it’s very adaptable thanks to the metric threaded holes located on both ends which can be used to mount attachments to fit various industrial applications.